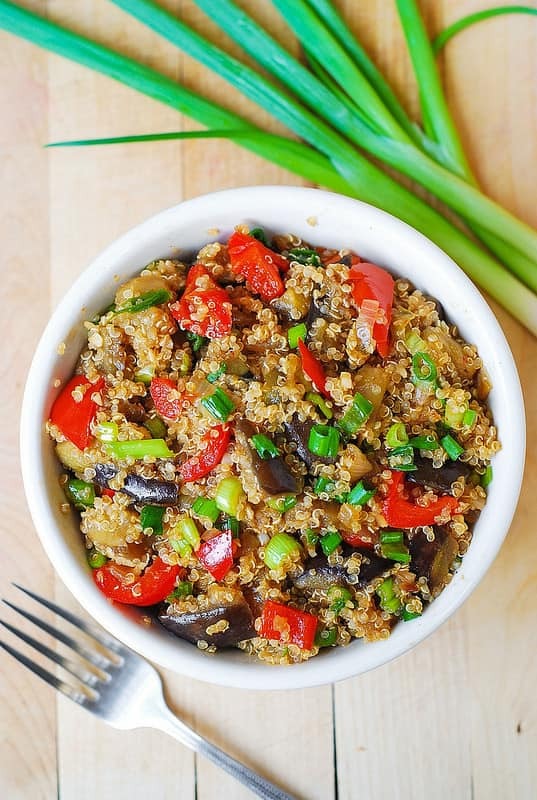 Spicy Asian Eggplant and Quinoa – this hot salad is packed with Asian flavors (soy sauce, fish sauce, Thai red curry paste). Lots of veggies: eggplant, onions, garlic, red bell pepper. I love using quinoa in salads or stir-fries, such as in this Spinach and Mushroom Quinoa or this Quinoa Salad with Roasted Butternut Squash, Pine Nuts, Caramelized Onions and Feta cheese. This is one of the best quinoa dishes I have ever made. I have previously combined eggplant and quinoa together in this delicious Roasted Eggplant, Spinach, Quinoa, and Feta Salad but I’ve never combined eggplant and quinoa with Asian flavors before. It turns out, this combination is so delicious, very flavorful, with all ingredients working really well together. 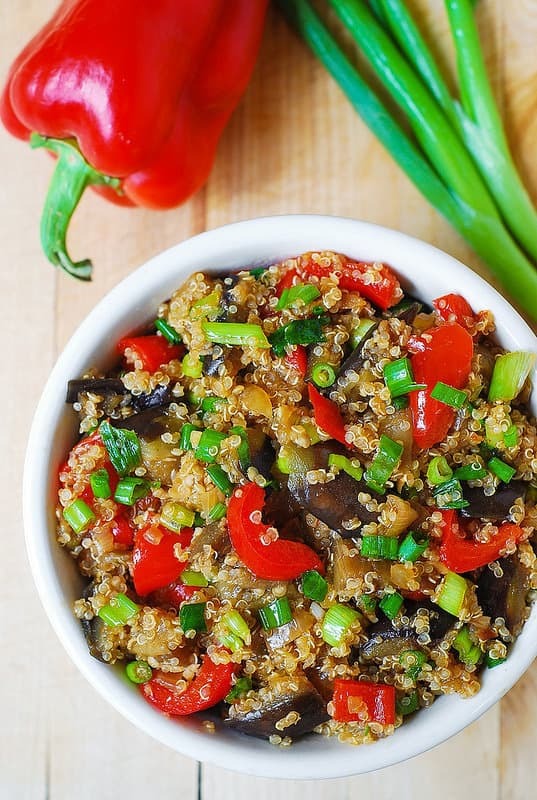 It is basically a stir-fried eggplant, cooked with other veggies, quinoa, with an amazing Asian sauce. The dish is also incredibly easy to prepare – it took me 30 minutes! Got to love it at the end of the working day! 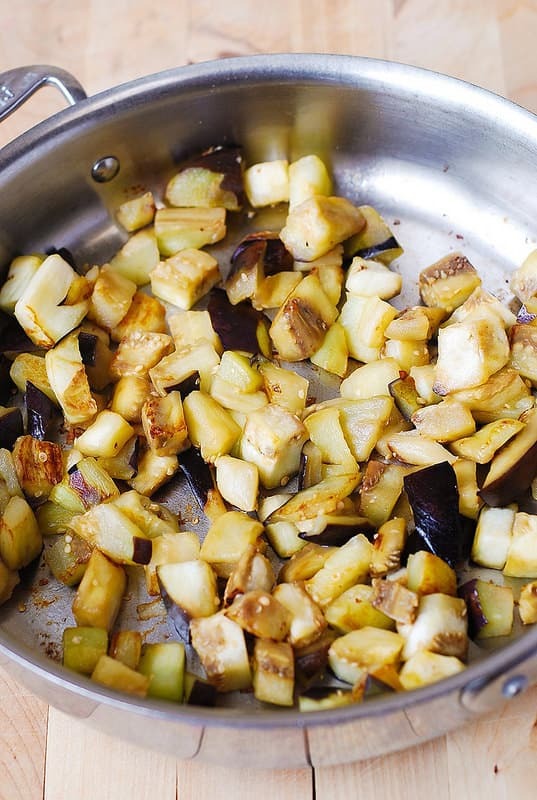 Then, remove the eggplant from the skillet, cook chopped onions and garlic. 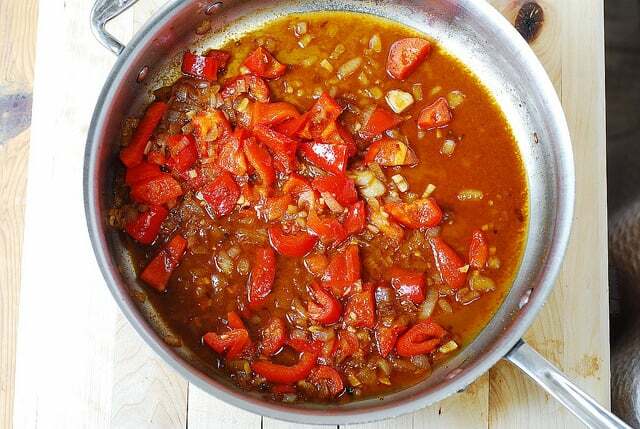 Then add and cook red bell pepper, then add all sauce ingredients (soy sauce, fish sauce, red curry paste, water). Keep in mind, that different brands of red curry paste have different levels of spiciness, in this recipe I am using a very spicy brand of red curry paste, and I am adding 2 teaspoons of it, which makes this dish moderately (not overly) spicy (for my taste). Use your taste as your guide, start with only 1 tablespoon of red curry paste to see if it’s too spicy for you. Then add 1 more if you like (or even 1 more extra, if you like things extra spicy). And, at the same time, add quinoa. NOTE that the recipe calls for 2 cups of already COOKED QUINOA (not dry quinoa). 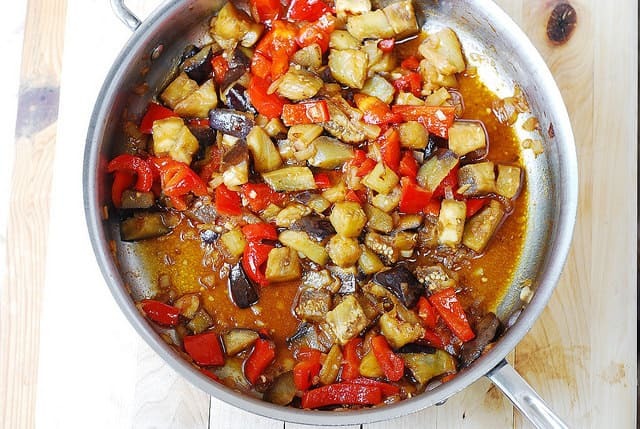 Continue cooking on low heat for about 5-10 minutes (or longer), until almost all liquid is absorbed and the eggplant is soft. 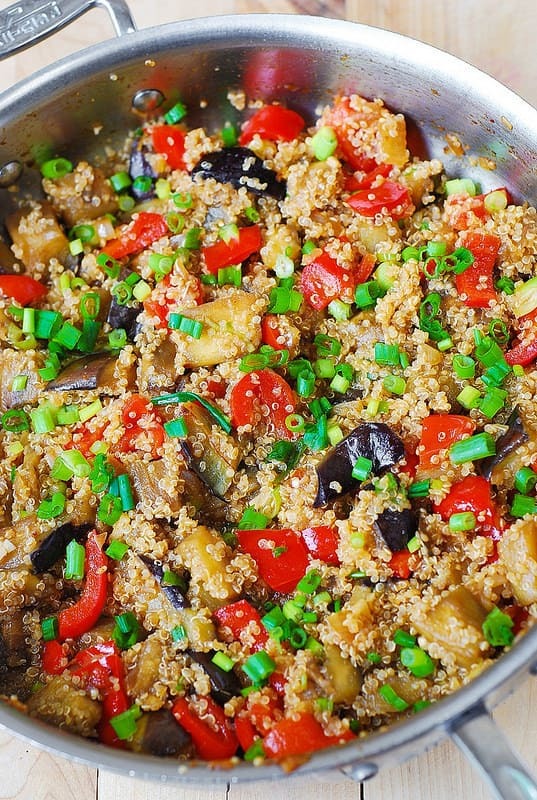 Eggplant and quinoa combined with Asian sauce is a delicious and flavorful combination. 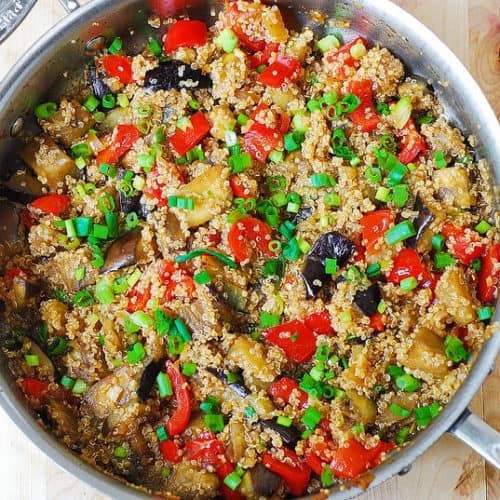 It is basically a stir-fried eggplant, cooked with garlic, bell peppers, onions, quinoa, with amazing Asian flavors (soy sauce, fish sauce, Thai red curry paste). What is the Thai red curry chili paste you listed in the recipe? I have Thai red curry and I have chili paste, but I’ve never heard of them together. If you can tell me a brand to look for or an image from Google so I can research it more, I’d appreciate it because I’m stumped. Thai Kitchen is one of the most readily available brands. It is a red curry chile paste…bottle says red curry paste, it is a paste made from red chiles. Not to be confused with sriracha. Hope that helps answer your question. Good looking lunch there, looks like it was made for me! Julia, this is a familiar recipe to me expect the quinoa. 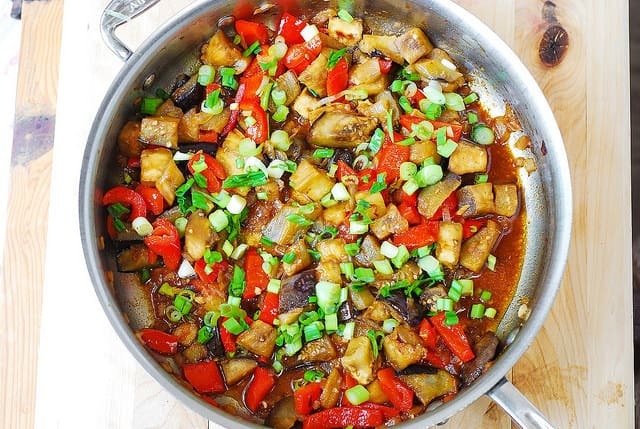 Spicy eggplant is always great with minced pork. How colorful and inviting! This looks delicious, Julia! 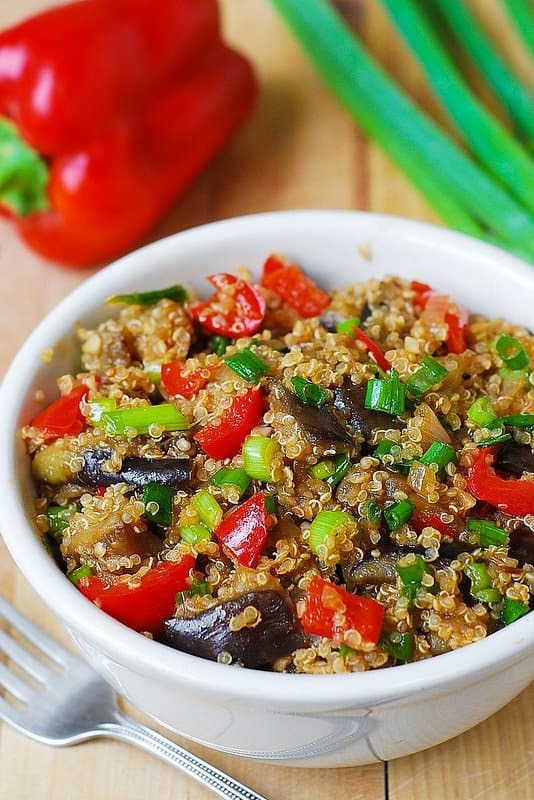 I think that the flavors of this dish could even get my husband to eat eggplant AND quinoa!! Well done!